Danú performed in our own series twice, back in 1997 and then again in 2001. They were a young, newly formed Irish band, based in Waterford, just starting to make a name for themselves. Now, they are better known and command a larger audience than we can handle, so Caltech Public Events has booked them for a special Christmas show and they will extend a $5 discount to anyone who mentions the Pasadena Folk Music Society when buying tickets in advance or at the door. Known for their assortment of jigs, polkas, reels and songs, back in 2001 they featured the fine singing of Clarán Ó Gealbháin. They have had a few personnel changes in the intervening years, including the addition of a new lead singer, Muireann Nic Amhlaoibh from Dunquin in County Kerry, their first female member. Clarán has left the band, but founding member, Dónal Clancy (son of Liam Clancy of the Clancy Brothers) has returned. This show at Caltech will be a homecoming, as they get ready to celebrate their 20th year anniversary in 2015. 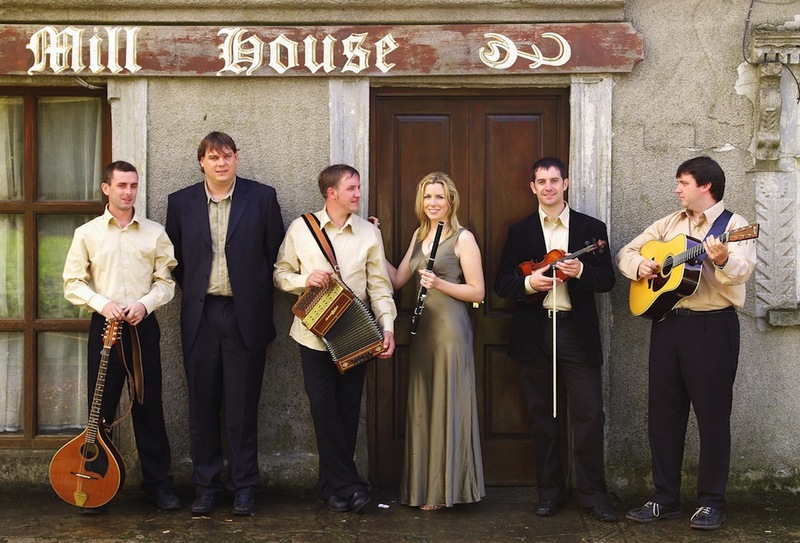 Featuring flute, tin whistle, fiddle, button accordion, bouzouki, and vocals (Irish and English), they have performed around the globe and recorded seven critically acclaimed albums. Christmas in Ireland is one of the most important holidays for families and friends, as many Irish people living abroad come home to gather in celebration. Local community choirs singing traditional songs for Christmas and Wrens Day (Dec. 26) are a common site throughout Ireland each December. Music and dance gatherings, in communities both urban and rural, have often combined for generations to offer a great variety of songs, music, and stories for the holidays. Tickets: All seats are reserved. Regular prices are: $32, $27, $22 / $10 Youth, but there is a $5 discount if you mention the Pasadena Folk Music Society when ordering or buying tickets at the door!